Sure, it's a rare case that supports both the 9.7-inch iPad and the Apple Pencil. It's just not worth the hassle. 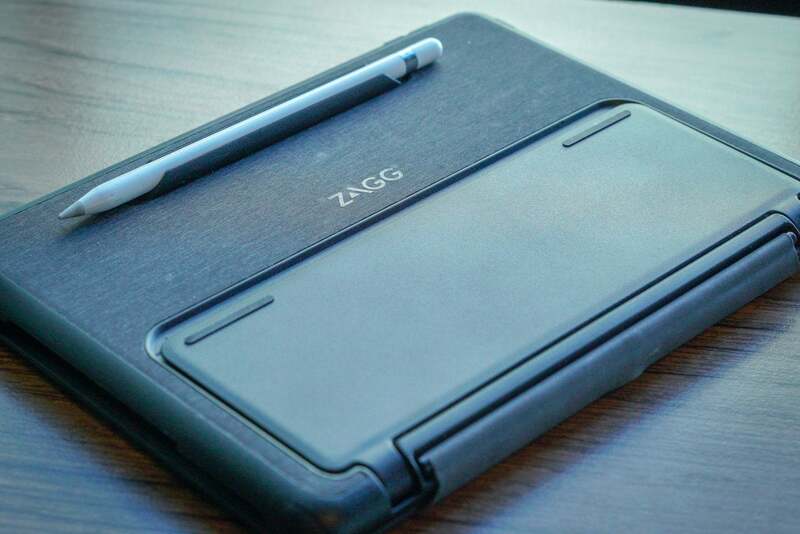 On paper, the Zagg Nomad Book sounds like the perfect keyboard case. It’s an outwardly sturdy 10.5-inch by 7.75-inch carapace that’s designed to hold everything from a 9.7-inch iPad and a 10.5-inch iPad Pro to a Samsung Galaxy Tab S3 in its loving embrace, which represents a rare stab at one-size-fits-all simplicity in an accessory market that’s often confusing in its specificity. 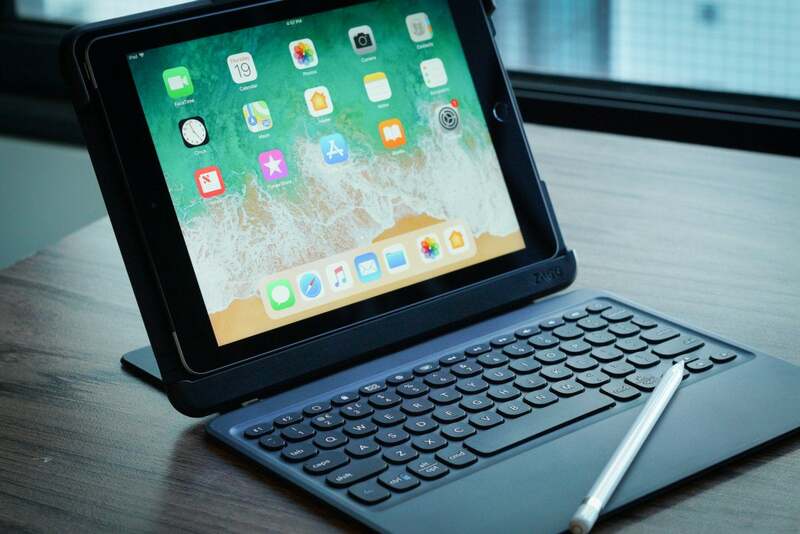 At the moment, it’s most remarkable for filling the unexpected void for 9.7-inch iPad keyboard cases that also come with a spot for the newly supported Apple Pencil. In practice, it’s a wonder that it even got off the assembly line. I can’t say I don’t admire its ambition. The Nomad Book is a little thick, but there’s little doubt that the case’s plastic portions can shrug off most direct impacts (although they’re prone to scratches and streaks that don’t easily rub off). I’m even a fan of the detachable keyboard, which complements my typing style so well that I entertained thoughts of using it in place of my beloved Logitech K810 when I type up stuff on my iPhone. It connects quickly. Adjusting the case for a differently sized iPad is technically merely a case of pushing your thumbs on the Apple Pencil holder and popping out a rubbery panel fitted for each supported iPad’s buttons and replacing it with the proper one. Instead of clamping the iPad into the case—as with so many other cases—you simply rest the iPad on a glue-slathered magnet housed in a 4-inch slot and press down. (Make sure you fit the case with the proper rubber fittings before you do this.) And that, in theory, is the end of the story. The magnet that keeps the iPad in the case (most of the time). Get it right the first time, as it'll take Hercules to get that magnet off the iPad later. Were Zagg not so determined to check off so many other boxes, I might have ended my review with a few words about how it’s too bulky for my tastes and left it at that. Alas, the problems rear their heads immediately. For one, the rubber buttons for volume and power on the replaceable inserts almost always fail to make contact with the iPad’s actual buttons, and so I found myself using the volume controls in Control Center more often than their physical counterparts. When I wanted to turn off the iPad immediately, I sometimes had to pop out the whole thing and hit the switch. And therein lies another problem. Even with the inserts, the iPad stays in place solely through the strength of the magnet. Most of the time, a swift pat on the case’s back suffices to send the tablet into my other hand. That’s all well and good when I’m trying to get the buttons to work—and, of course, those buttons should work inside the case anyway—but it’s downright frightening when the case accidentally drops from my hands and hits the floor. Drop it at the right angle while the case is open, and the weak magnet could easily send the iPad flying from its shell. (In fact, it’s kind of funny that the glue that holds the magnet on the back off the iPad is so strong—I’m not yet sure how I’m going to remove it.) And so, despite all that toughness, despite all those fancy inserts, there’s still a good chance you’ll wind up with a shattered screen. It’s a worst-case scenario, admittedly, but the worst cases seem more probable with this case than what we see in some of the competition. And that’s to say nothing of the other issues, such as the way the Apple Pencil holders feels awkward in its perch on the face of the case (even though it admittedly does a good job of keeping it in place). That’s to say nothing of the way the Lightning port ends up hidden deep inside the case when you’re using it for the 9.7-inch iPad, making it slightly annoying to recharge. The Nomad Book comes with a stand that keeps the display propped up when you’re using it like a laptop, but it’s a stubborn thing to pull back. Half the time I felt like I was trying to pry open an Egyptian sarcophagus. I tried to remove those streaks on the back for the photo, but the case would have none of it. For that matter, the keyboard only hangs on the case proper with a thin magnet (much as in the case of Apple’s own Smart Cover), which means it easily detaches from the case if you pick it up thinking it’s a regular “laptop” case. Maybe you could eventually get used to that, but I’m willing to bet that a friend or child will pick it up in the belief that it’s all made of a one piece. They’ll pick it up wrong and it one half will fall to the floor. 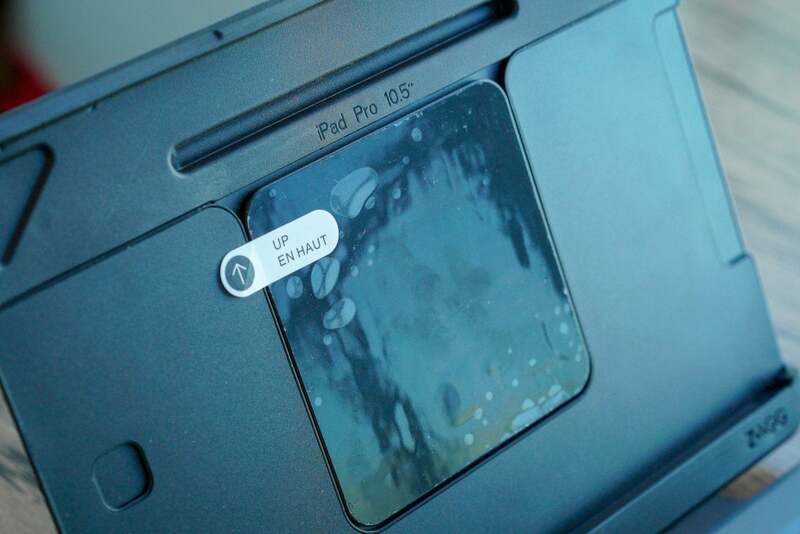 And so again we’re back to the problem of the tablet popping out on impact. There is, of course, the absence of a Smart Keyboard connector to contend with if you’re planning on using it for an iPad Pro, but chalk that up as a casualty of its desire to be all things to all tablets. For our purposes, it simply means that you’ll have to remember to charge the keyboard separately from the iPad itself. Let’s remember that Zagg often makes fine products. Heck, some of them are easily the best in the business. This just isn’t one of them. For all of the sturdiness of its super-thick case and the satisfying typing experience of its keyboard, the Nomad Book is far too riddled with problems and qualifications to justify its $100 price tag. Frankly, I’d shy from recommending it for even half that. But get this: There’s also no opening for the 10.5-inch iPad Pro’s rear camera. The Apple Pencil holder was initially the feature I disliked the most, but (unlike most other elements), it grew on me with continued use. The protection it offers means little when nothing keeps the iPad in place save for a weak magnet and a foldable case design that doesn’t properly keep it closed when not used. The convenience of adjusting to multiple types of iPads is of little help when the interchangeable pieces come with buttons that don’t even work half the time. This is a case that costs almost a third of what a regular iPad costs, and yet it’s a potentially expensive disaster waiting to happen. The box it comes in is better designed than the case itself. Leave this Nomad to wander alone. 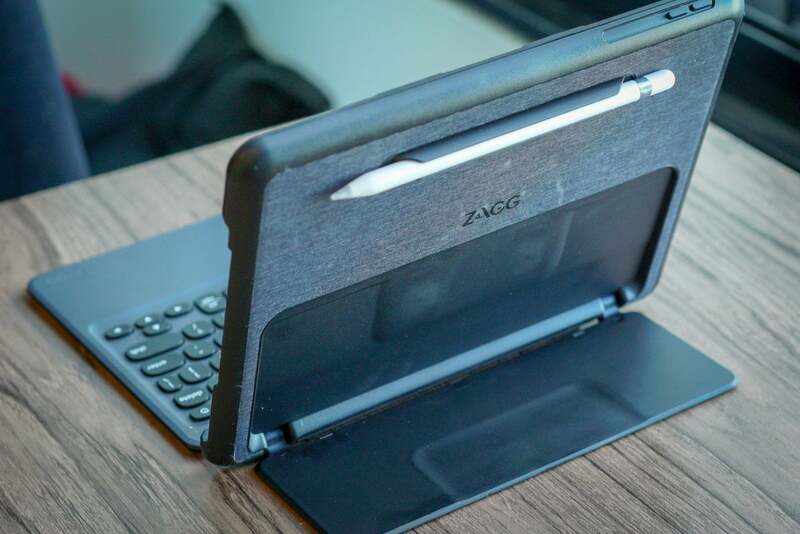 An ambitious keyboard case for tablets that fits multiple Apple and Samsung tablets. Unfortunately, that versatility makes it a weaker case than it should be.